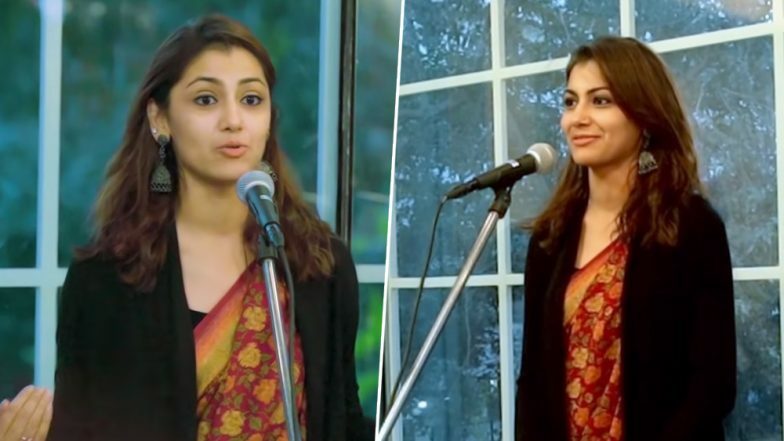 Sriti Jha, the beautiful and talented lead actress of the much-acclaimed show, Kumkum Bhagya, recently recited a beautiful poem 'To Like? Or Love?' at Spoken Fest organized by Kommune, a performing arts collective. In this poem, the actress very beautifully expresses how trapped she feels by the intense emotional burden that love brings. Kommune India recently dropped the video online and we of course loved it! Sriti, in her poem, uses Puchhkas as a metaphor to explain the captive audience that how she felt too suffocated and confined in forced love and how she rejected the beautiful people around her because of it. Sriti received huge appreciation when her talk was posted on social media. Kumkum Bhagya Leap: Not Kirtida Mistry But Mugdha Chaphekar Bags The Shabbir Ahluwalia-Sriti Jha Starrer! Sriti, who is an avid reader and writes poems, too took to the photo-sharing app to share the video and wrote, "To like or to love. This piece wouldn’t be possible without @runawaybookworm. Thank you for making me do this🤗🤗 I hope you guys like it." For the uninitiated, Spoken Fest gives the young poets and storytellers a platform to share their work with fellow poetry enthusiasts. It's a stage for some of the most vibrant voices, poets, storytellers, thespians, lyricists, comedians and musicians a platform to move us and make our heart sink and brim with joy at the same time with their amazing recitals. On the professional front, Sriti Jha, who rose to prominence with her roles in the shows Jiya Jale, Jyoti, Dil Se Di Dua... Saubhagyavati Bhava?, Balika Vadhu, is currently seen in Zee TV's Kumkum Bhagya. The actress even won the Indian Telly Award for Best Actress award for portraying the character of Pragya in the popular soap opera Kumkum Bhagya. Watch this space for further updates.